There could be 100 people in a room, and 99 of them aren’t in a relationship with Lady Gaga, but could Jeremy Renner be the 1 who is? Gaga has reportedly been “spending time with” actor Jeremy Renner. 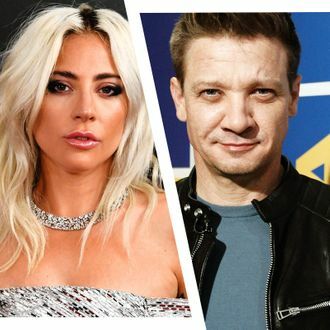 Tabloids are split on the status of this pairing: One source told People the two have been spotted together, while a separate source told Us Weekly that the insider “doesn’t believe it’s romantic at this point,” but that Gaga has been spending time with Renner and his 6-year-old daughter. The singer, pregnant with her album #LG6, ended her engagement with talent agent Christian Carino last month. The two dated for two years before their five-month engagement. Gaga has repeatedly denied rumors that she is secretly in a relationship with her Star Is Born director and “Shallow” partner Bradley Cooper. (What an American hustle that would be!) Jeremy Renner’s app, meanwhile, has been curiously silent about the Gaga rumor.